If there’s one thing that virtually all economists, political pundits and members of the American workforce can agree on, it’s that the recent trends in economic mobility in the U.S. are a problem. What they don’t agree on, however, is a solution. One policy option that has generated significant attention, and will likely continue to do so in the lead-up to the 2016 election, is increasing income taxes on top earners, and in turn giving those funds to those on the bottom. It sounds like simple math, and has an allure for many politicians and American families alike, but new Brookings research suggests that this proposal would actually do little to reduce inequality. In a new paper from Brookings Economics Studies, Brookings Senior Fellow William G. Gale and Nonresident Seniors Fellows Melissa S. Kearney and Peter R. Orszag put this policy option to the test. Using data from the Urban-Brookings Tax Policy Center (TPC), the researchers created a model to determine how much we could reduce inequality by increasing the top individual tax rate to as much as 50 percent (it currently stands at 39.6 percent). What they found was that raising the top income tax rate to 50 percent would mean an additional $6,464 in taxes owed for households in the 95-99th percentiles of income and an additional $110,968 for households in the top 1 percent. Extremely wealthy households in the very top 0.1 percent could expect to experience an average income tax increase of $568,617. 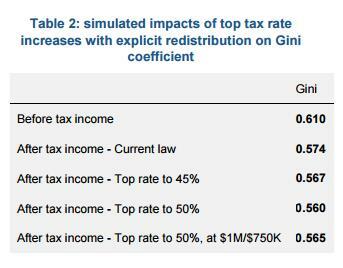 To see how these after-tax income reductions would actually affect gaps between the rich and the poor, they used the Gini coefficient – an index commonly used by economists to measure inequality levels. Sweden has the lowest Gini score (meaning it has the most equality), whereas the U.S. is ranked 41st and ranks last among countries in the developed world. What they discovered was that increasing the top marginal tax rates for those in the 95th percentile and up had a “trivial effect on overall income inequality,” only lowering the Gini coefficient modestly. So raising taxes for top earners didn’t move the needle on inequality, but what if these new taxes were redistributed equally to the bottom 20 percent of all American households? According to their model, that, too, had surprisingly little impact on improving inequality — though it would appreciably increase the incomes of those at the lower end: Re-distributing revenue from the 50 percent tax rate would result in $1,760 in additional post-tax income for households in the lowest quintile of earners. Despite observing “quite modest” reductions in inequality through this model, the authors were careful to point out that there could be other good reasons to implement tax and transfer plans: Tax hikes for top earners could raise critical revenue for the federal government, and redistribution policies would still provide substantial benefits to low-income households, if not economic mobility as a whole. Read the full paper, “Would a significant increase in the top income tax rate substantially alter income inequality?” here.